But for a different reason! 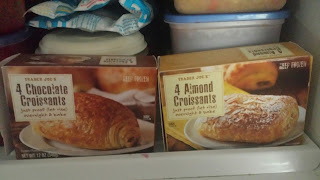 I am afraid if I recommend a trip to Trader Joe's for these delicious croissants - then the supply will be wiped out (which has happened for my husband's ice tea there - and the dog goodies we like!). Got these on a whim to try - believing too good to be true - and they would be all dough and no filling - but I was wrong! But I will warn you - it is hard to eat just one!